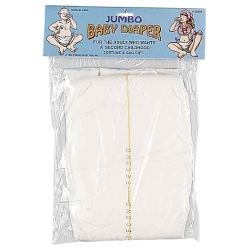 The adult baby diaper is the perfect start to creating your own unique and custom adult baby costume for Halloween. Just pair it up with any number of our different adult size baby costume accessories. The adult baby diaper also makes a funny gag gift! The adult baby diaper is colored as pictured and is available in one size fitting up to a 38” waist.